Full Trailer for Marvel’s Agents of S.H.I.E.L.D. plus 10 things we want to see! This past weekend we saw official pick-up announcement and teaser trailer for Marvel’s upcoming television show Agents of S.H.I.E.L.D. and fanboys everywhere rejoiced. Marvel’s Cinematic Universe has already been a highly successful gamble that has paid off handsomely for Marvel and their now parent company Disney. I know that I am not the only one that sees the upcoming release of the series, which will be set within the same universe as the rest of the Cinematic Universe, as an extremely smart idea and a way to introduce many smaller characters or story lines into the overall Universe. Pretty awesome stuff there, huh? Ok, I am going to go out on a limb and say this right now. J. August Richards is not playing Luke Cage. I have to credit the good folks over at io9 for this revelation. They have a very good article pointing many of the hidden secrets inside of the 30 second teaser that was shown during the season finale of Once Upon A Time. Their guess? Elvin Daryl Haliday (Rage), who in the comics, has ties to not only The Avengers but also The New Warriors. The image in the comic bumper before the teaser is a very strong indication that this is correct as I doubt that Marvel randomly pulls just any images for the bumpers. Now that we have that out of the way, let’s take a look at 10 things we (well me at least) want to see in the show. Be sure to let us know which ones you agree with, hate or ===gasp=== missed in our list. I think it is important to point out that at this point, Marvel’s Agents of S.H.I.E.L.D is interesting in that many people are still trying to figure out just exactly what kind of show it will be. Is it going to be an X-Files / Fringe / Warehouse 13 / NCIS type show that deals with super-powered people and things? No one is quite sure. Either way, it will most definitely fit into the Marvel Cinematic Universe. I know what you are saying…. ENOUGH WITH THE ACRONYMS, but let’s face it, the world is already full of acryonyms. CIA, FBI, ATF, etc. What’s really cool about S.W.O.R.D. is actually three things. First, this is a division of S.H.I.E.L.D. 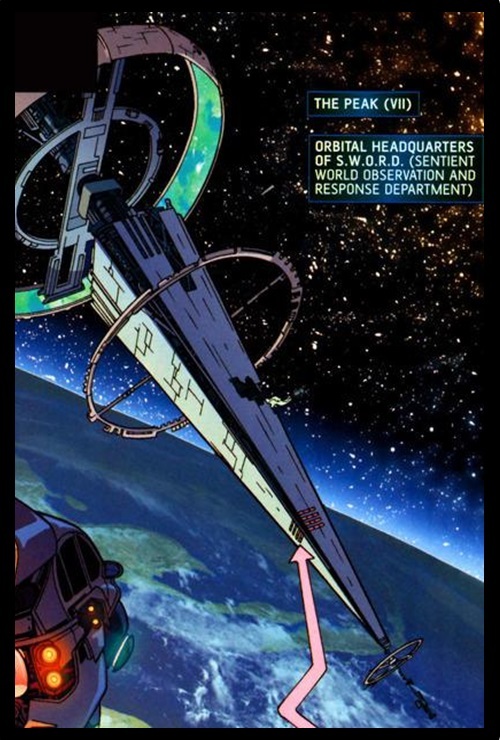 that monitors extraterrestrial threats to Earth and let’s face it, after the events in THE AVENGERS, it only makes sense that we would see this division of S.H.I.E.L.D explored. Second, they were actually mentioned in the alternate ending for THOR. Yep, that’s right, Dr. Eric Selvig mentions both them and S.H.I.E.L.D in the same conversation. Last, but certainly not least, S.W.O.R.D. was created by none other than Joss Whedon. Yep, the very same Joss Whedon who directed the biggest superhero movie of all time not to mention the pilot episode for Agents of S.H.I.E.L.D. That being said, I would say that there is a good chance that we will see them mentioned, if not fully explored, in the series. 9. Agent Wendell Vaughn / Project P.E.G.A.S.U.S. Much of the Marvel Cinematic Universe is modeled after the Ultimates line of comic books so with that in mind, it would be extremely interesting to see the introduction of a certain Agent whose name is Wendell Vaughn. For those unfamiliar with the comic book world, you might not realize that this is the name of one of Marvel’s premier cosmic superheroes, Quasar. 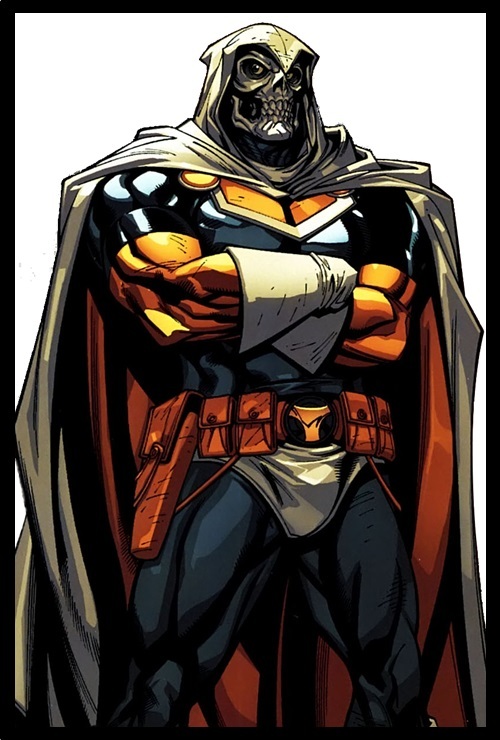 While in the Ultimate comics, Vaughn has yet to become the cosmic hero with his mighty wristbands that help him control light, teleport and create energy constructs, this doesn’t mean that this could not be explored (at least in the latter episodes) especially with the cosmic side of the MCU being introduced in THOR, THE AVENGERS and next year’s GUARDIANS OF THE GALAXY which is said to be set 95% in space. While the cosmic aspect is exciting and fun, Agent Wendell Vaughn also serves another purpose. 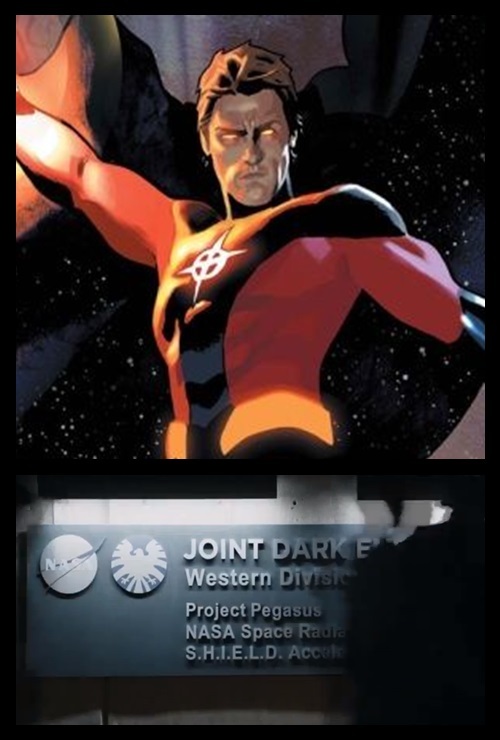 He oversees the top-secret Project Pegasus which is essentially Marvel’s version of Warehouse 13. If it is strange or unknown, it is probably stored here. For those eagle-eyed viewers out there, they will know that Project Pegasus has already popped up in the MCU in IRON MAN 2 (see the image above) as well as the after-credits scene in THOR and the opening scene of THE AVENGERS. If you are paying attention then you know that this, of course, means that Project Pegasus has been destroyed by the Tesseract’s energy, however, do you really expect a place like this to not be rebuilt? There is so much potential of what Marvel could do with this facility and with Vaughn himself even they are not in every episode. 8. A.I.M / Hydra / Etc. A.I.M. 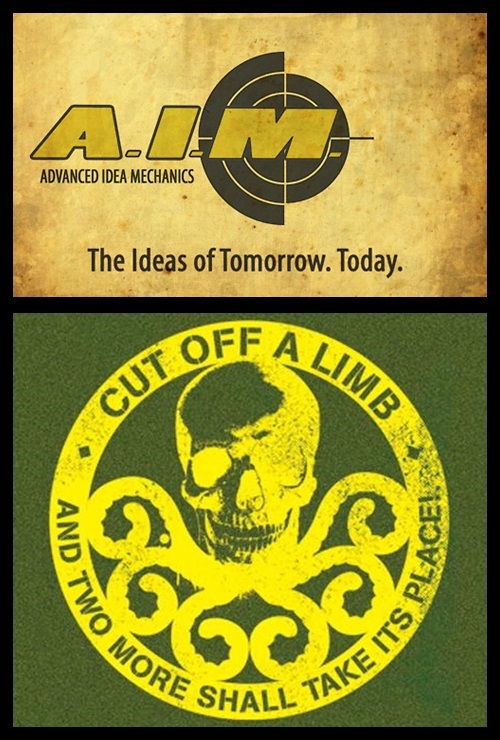 or Advanced Idea Mechanics and Hydra are two terrorist organizations from the comics. Both of them have acted as foils for S.H.I.E.L.D and both have seen their presence made in Phase 1 of the MCU. Hydra was first seen in CAPTAIN AMERICA: THE FIRST AVENGER as the organization that Hugo Weaving’s Red Skull led and A.I.M. was first seen just recently in IRON MAN 3 as the organization founded by Guy Pearce’s Aldrich Killian. Either way, whether it is one of these two organizations or other organizations including, but not limited too, Serpent Society and ULTIMATUM, S.H.I.E.L.D. needs to have enemy organizations to combat. My bet is that the main foil, the KAOS to their CONTROL, will end up being Hydra, but again, that’s just a guess. So, if you are going to have a major terrorist organization, then you need a leader…. Since it is my belief that Hydra will be the main foil in the show, or at least a common thorn in their side, it only makes sense that we get a “face” for the organization, a head honcho that can either be prominently seen or at least alluded to in the series before the big reveal. 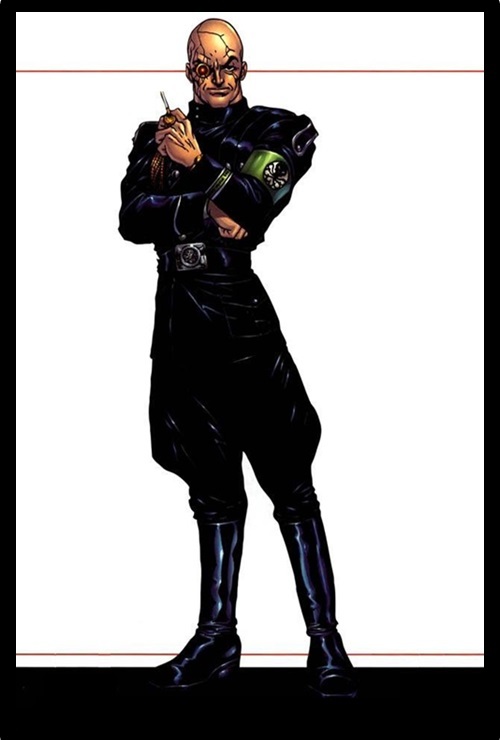 Comic fans will recognize Baron Wolfgang von Strucker as he has had his roots tied to Captain America and S.H.I.E.L.D. for quite awhile dating back all the way to World War II. Of course, in the comics though, so has Nick Fury. What I find interesting is that Baron Strucker has been so devious in the comics that he has actually managed to infiltrate S.H.I.E.L.D. using sleeper agents and decoys so that possibilities are endless. Also, you may not realize this, he has already been portrayed on TV during the made-for-TV movie NICK FURY: AGENT OF S.H.I.E.L.D. which starred the Hoff himself, David Hasselhoff as the one-eyed world protector and the nasty Baron was played by Campbell Lane. Between you and I, I think it is time this baddie gets a good outing. Of course, the only question that then remains is whether or not you touch on his physical augmentation which leaves him virtually ageless, able to return from the dead and possessing a body full of death spores that threaten to leak out if he is ever fully killed. To spore or not to spore, that is the question. 6. The Purple Man / Stiltman / Scorpio / etc. The idea here is that with Marvel having a catalogue of over 3,000 characters at their disposal, there is no need to make up antagonists for the show. Already we have a show that will be led by all new characters that do not appear in the comics (yes Phil Coulson has now made his way into the comics, however he was not originally from the comics so there) so to really cash in and capitalize on what this show can do, I feel it is important for Marvel to dig deep into their vaults and pull out characters to use in the show that will offer interesting heroes and villains for S.H.I.E.L.D. to hunt down, but also offer Marvel fans those geek out moments that they so desire. When you have characters like The Purple Man (mind-control), Stilt-man (a villainous poor-man’s Iron Man), Scorpio (several variations including a disguise that Nick Fury used to infiltrate Hydra) and so many more, it almost seems pointless to try and create new characters. Many of the characters that fit into this category are not well known enough to helm their own movies nor are they powerful or menacing enough to act a movie’s villain so bringing them to TV is a great way to utilize these characters. Again, let me point out, even though I have referenced villains in this section, this also goes for heroes too. Cloak and Dagger anyone??? Yep, this is going off the idea that J. August Richards is not playing Luke Cage in the show. 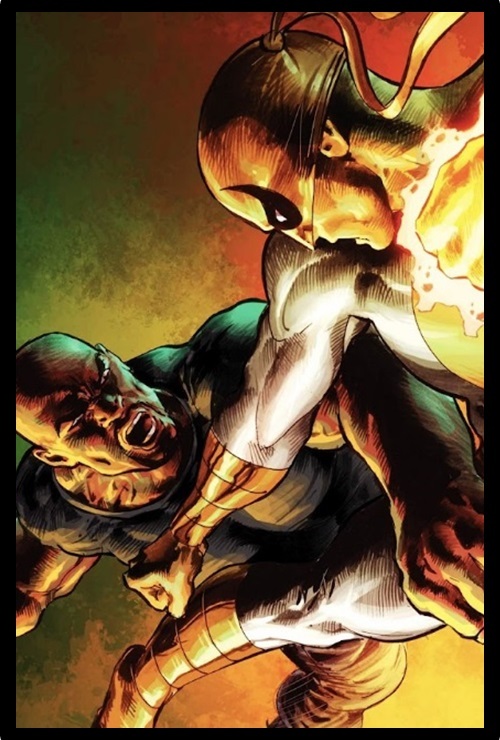 Of course, even if he is, that doesn’t diminish the fact that many a Marvel fan wants to see these two, Luke Cage (Powerman) and Danny Rand (Iron Fist), make their way onto the screen at some point whether it is in their own movie (I know that his style may not fit with the rest of the MCU but Quentin Tarantino would make a phenomenal Heroes for Hire movie. Blaxploitation mixed with Kung-Fu? Yeah, I know you agree.) or their own TV show. Well, I believe that by including these two in the Agents of S.H.I.E.L.D. TV show, they can set up a spin-off for a Heroes for Hire TV show if the characters are well received by the audience. This is actually the first of two that I will mention on here that I believe have that potential and with shows like Law and Order and CSI using existing shows to spin-off new versions, why not Marvel? These two are very interesting and pair well together as they are kind of polar opposites that work well together, kind of like a ying to the other’s yang. Plus the whole “if you have the money, we are you’re heroes” concept is unique to TV land. Hang with me here for a moment. 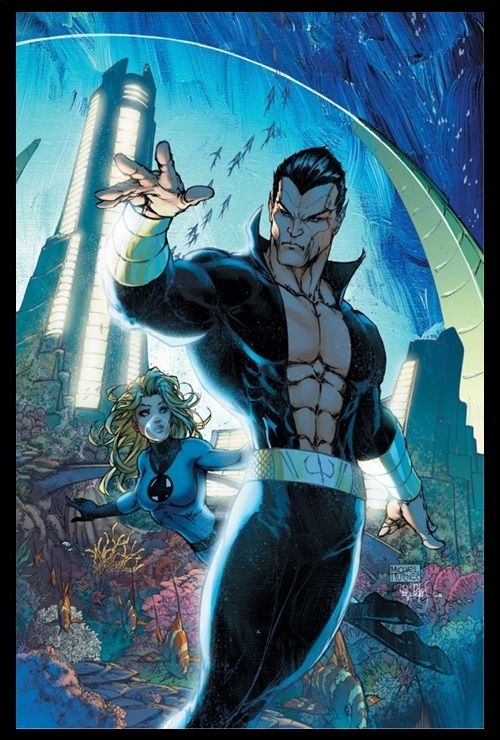 I think to do the character of Namor the Submariner justice, you really need a large budget, especially if you are going to show his home-world of Atlantis where he is Prince, HOWEVER, that doesn’t mean that you can’t continually throw in references to the character or to his world of Atlantis to get people familiar with the idea that the city of Atlantis is real in the MCU. Simple references like “we are keeping an eye on a situation that is developing in the middle of the Atlantic” or things of this nature would be good nods, great Easter Eggs and could possibly build to more. The movies themselves are ripe with Easter Eggs including the original android Human Torch in CAPTAIN AMERICA: THE FIRST AVENGER and a blink-and-you’ll-miss-it reference to both Namor and The Black Panther in IRON MAN 2. Why then would you not put those kind of Easter Eggs, ones that you could build off of for later shows, seasons and movies, into this series as well? You most definitely would add those kind of nods and Namor is a great one. 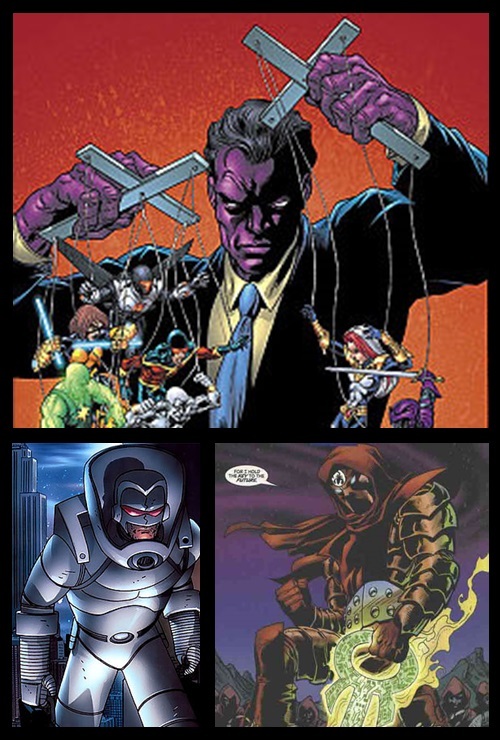 Taskmaster, aka Tony Masters, is one of those characters that has acted as a villain and a hero and in some incarnations has even been an agent of S.H.I.E.L.D. Taskmaster has a wonderfully simple set of powers that are easily translated to the small screen. He has what is called photographic reflexes and is able to mimic the fighting style of anyone he engages in combat or witnesses in combat. Because he can fully mimic these people, he can also anticipate what their next moves are which makes him extremely lethal in combat. He is an excellent hand-to-hand combatant, excellent with most weapons and can even mimic the voices of other people. Whether he is used as a villain, a hero or a character that switches allegiance, he is a definite must for the show. Tasky needs some live-action love! 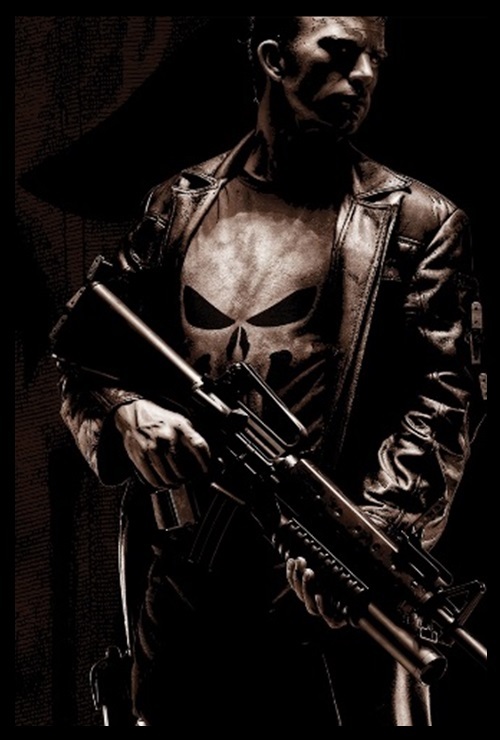 This is a tough one because I really want a Punisher TV show, but ABC is not the place to do it right. With that said, I still believe that Frank Castle can still make an appearance in the show. He could easily be someone that S.H.I.E.L.D. is keeping an eye on that you don’t actually see until the last episode of either the season or of an arc. He is very interesting and with his ties to the government, NOT mentioning him would be a crime and remember, Frank Castle doesn’t like crime. Here is where it gets a little tricky. If you are going to include him, he absolutely must be played by Thomas Jane. THE PUNISHER was the best version of the character we have had to date and Jane absolutely loves the role. He has even gone so far as creating a fan-film called DIRTY LAUNDRY and if you haven’t seen it, you must stop and go watch it at the link I have provided (just come back here when you are done.) Pretty awesome stuff right there. Hey Marvel, make this happen! Ok, here we are at number 1. If ever there were a character that deserved to be on TV, Daredevil is it. As I mentioned above with Heroes for Hire, there are two entries on this list that I feel could easily be spun-off into their own shows and Daredevil is one that is literally begging for it. Now that Marvel has the rights back for the character, a proper introduction to the character could open the doors for a new show. Daredevil could easily be a Law and Order / Castle style show from the legal side of things with the inclusion of a horned vigilante. Right now, the only real exposure that the general public has with the character is the dismal Ben Affleck DAREDEVIL which I will agree had some of its share of fans, but really did not showcase the character properly. 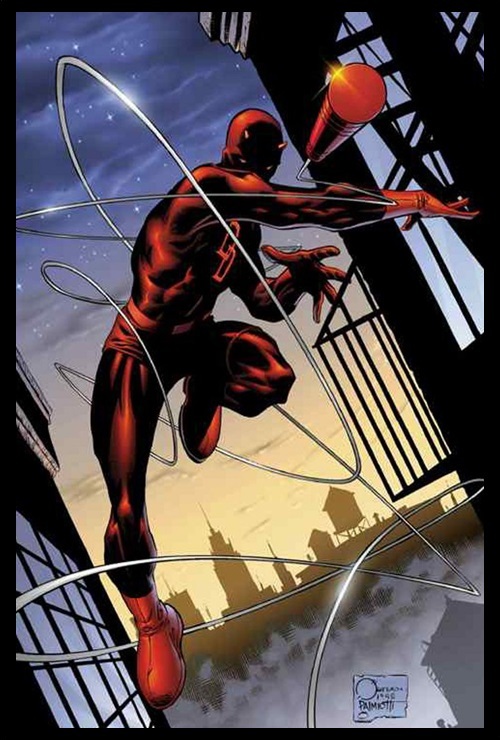 I would love to see Daredevil get his own show and I think using Marvel’s Agent’s of S.H.I.E.L.D. is a great stepping off point. So there is our (my) list of the top 10 things I want to see in the show. What did we (I)miss? Marvel’s Agent’s of S.H.I.E.L.D. is directed by Joss Whedon (Pilot) and stars Clark Gregg, Ming-Na Wen, Brett Dalton, Chloe Bennet, Iain De Caestecker, Elizabeth Henstridge, Shannon Lucio and J. August Richards. Marvel’s Agent’s of S.H.I.E.L.D. is set to hit the small screen this fall on ABC at 8:00pm Eastern, 7:00pm Central. Nick Fury told Steve that Hydra was stopped during WW2, so having them on the show wouldn’t make much sense. I’d like to see Namor, and Thomas Jane properly reprising Frank Castle would be awesome. I know its very unlikely at this point, but my inner geek still wants a darker, proper sequel to the director’s cut of “Daredevil”. It’s one of the best pre-MCU films, period.